The Australian Group on Antimicrobial Resistance (AGAR) is a collaboration of clinicians and scientists working in diagnostic medical microbiology laboratories located across Australia. The group gathers information on the level of antimicrobial resistance (AMR) in bacteria causing important and life threatening infections and is a key component of Australia's response to the problem of increasing AMR. It defines where Australia stands with regard to antimicrobial resistance in human health. 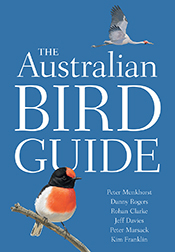 The most comprehensive and beautifully illustrated field guide to Australia’s unique birdlife.